At the midth of May my Product Owner and Scrum Master colleagues together with our Head of development and CIO had the chance to visit Daimler Fleetboard for a mutual exchange of experiences here in Stuttgart. The contact with Fleetboard – a 100% Daimler AG subsidiary for digital solutions for the transport and logistics industry – came through Markus, one of the POs, whom I had met last year at the inspiring Productized conference in Lisbon. The idea behind this meet up was, that both companies live in a corporate environment where traditional and agile mindsets bump into today’s challenges of digitalization and disruptiveness. We had a very warm welcome with fingerfood and cold drinks and Markus introduced us to his colleagues and showed us the location. We met in a Fleetboard open space office, which is separated in some smaller glass rooms and cozy retreats for just two persons. All (glass) walls are covered with motivating quotes or excerpts from ongoing projects. Even the ceiling was used to hang up some posters. Creativity & Scouting: Everyone is encouraged to generate and suggest ideas for digital products. These ideas are scouted by a committee. Elevator Pitch: Each participant can present an idea for about 15 minutes (5 min presentation & 10 min Q&A) in front of a cross-functional jury and has to proof the real customer need. So it’s also possible to bring one real customer to a pitch. At the end every juror has to decide and can throw a coin in order to vote for or against the idea. If an idea wins by majority the participant is supported for the next four weeks by a chosen mentor from the Jury, who have voted for the idea. Prototype Phase: The participant can set up a team of developers, UX experts and other needed stakeholders in order to build a prototype. Shark Tank: The Shark Tank is the most crucial stage, because it’s a do or die decision! Once again the idea is presented with the prototype together with a business plan. And once again the jury of decision makers (including a controller) have to make a decision. If the project passes the jury, it is integrated into the roadmap. Afterwards a “Virtual CEO” is named and a budget is allocated. Otherwise it’s buried on the cemetery, with the chance of revival. Implementation Phase: When the project is prioritized on the roadmap, it is implemented by a x-functional product team. Market Entry: The product is rolled out and will be incrementally extended. In my eyes a courageous, playful and thought-out approach to generate innovation and paves the way for bringing ideas to life for everybody! 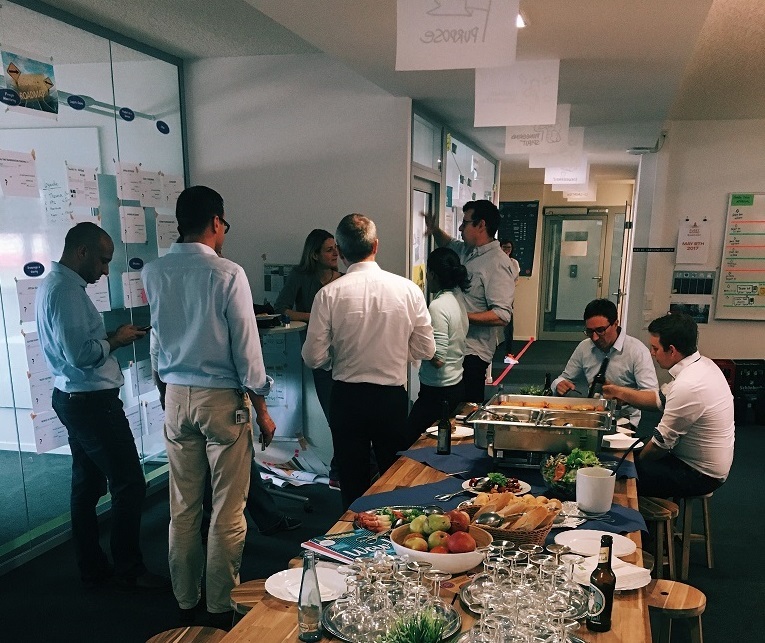 Leadership: Daniela, as the CEO, is sitting by the team having extremely high and direct interaction with the Product Owners and the development teams, soaking up new hot topics or problems and sending the message “Primus inter pares”. Vision: Fleetboard has the inspiring and highly-motivating vision “Driving logistics forward” with the goal to revolutionize the logistics industry and bring tangible benefits to the customers, which unfolds its power not only to every employee but also to every candidate in the recruiting process. Transparency: All important information like guiding principles, vision, mission, personas, etc. is transparent to everybody by physically hanging them up with creative posters and boards! So the current status and responsibility of upcoming and ongoing projects is visible for all. Customer development: At least one time per month it is mandatory for each product person (including Daniela!) to visit at least one real customer. An official chart shows, if somebody didn’t reach this goal. Recruiting: Every potential candidate is introduced and checked by the (development) team, so that the team spirit is strenghten right from the beginning. The second talk came from Carsten Raven, Head of Software Development, who gave a brief introduction into the Bosch Smart Home GmbH (Home) and their current product portfolio before explaining the current development process – from idea to roll-out. The challenge for Home is that it is both a software and a hardware company. Some components like hardware devices and system infrastructure are developed on a different time scale with different dependencies as the user perceived feature development and front-end, that is app development. Where the latter is following an agile process (adapted Scrum), the former projects rather follows gated milestone (aka waterfall) processes. Bringing both types of projects and processes together is challenging from a planning perspective, as well as from an operational daily business. Home is tackling this challenge by continuously improving the internal processes month by month. Carsten accentuated, that the transformation of the Scrum ritual “review” to an open “marketplace“, where every department is invited to show their current projects at the end of a sprint, is one of Home’s biggest success factors for linking both worlds and mindsets! Every party, wether dev team, sales, marketing or support, can build up its own little booth and show their current work and collect early feedback from all the other stakeholders like the CEO or other board members. It’s like being on a real marketplace where’s a very vivid atmosphere with loud and intense talking. The feedback on both sides was very clear: We’ve learned a lot from each other and we can take away some interesting and inspiring insights from the other party. Personally I found it absolutely gorgeous, how transparent and frank the guys from Fleetboard opened their doors for us! Everyone in the room was pretty sure, that we should repeat this format again this year.